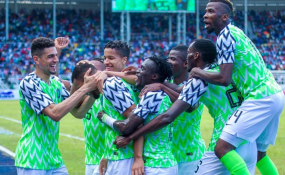 Three European clubs Chelsea, Arsenal and Bordeaux have reacted to Nigeria's 4-0 Africa Cup of Nations qualifiers win against Libya through their official websites and social media accounts. The three clubs monitored the activities at the Godswill Akpabio International Stadium on Saturday as their respective players in the shape of Ola Aina, Alex Iwobi and Samuel Kalu were in action for the Super Eagles. Arsenal highlighted that their number seventeen provided the assist for Odion Ighalo's second goal, saying : " Alex Iwobi claimed an assist in Nigeria's 4-0 Africa Cup of Nations qualifying win over Libya. "Iwobi then set up Ighalo's second with an inch-perfect through ball, with the former Watford striker claiming his hat-trick soon after.